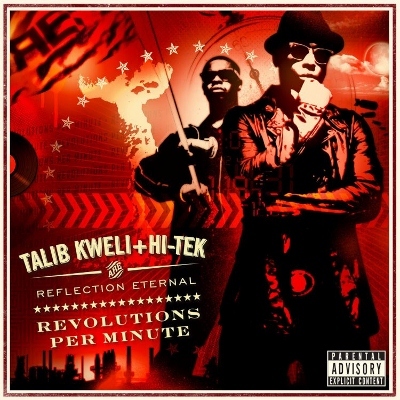 It has taken a decade for Talib Kweli and DJ Hi-Tek to resume their partnership, but Revolutions Per Minute sounds like the two never parted. In spite of his freelance assignments for G-Unit and other thug rappers, Hi-Tek resurrects Reflection Eternal’s jazzy hip-hop with ease. Kweli chimes in with topical songs, from the excellent “Ballad of the Black Gold” to the revolutionary call “In This World.” On “Just Begun,” the two lend the spotlight to Jay Electronica and J. Cole, two newer voices and the inheritors to Reflection Eternal’s legacy of conscious hip-hop. This entry was posted in Reviews, Short Cuts and tagged Hi-Tek, Reflection Eternal, Rhapsody, Talib Kweli, Warner Bros.. Bookmark the permalink.